The Pro L1505UH combines a laser light source and 3LCD technology for powerful, uncompromising images. 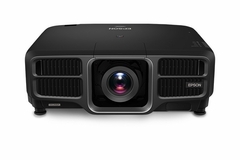 This premium large-venue projector features native WUXGA performance with Epson® 4K Enhancement Technology1. Delivering 12,000 lumens of color/white brightness2, the Pro L1505UH offers bright, vivid color, while its laser light engine and electrostatic air filter provide virtually maintenance-free operation for up to 20,000 hours3. This sleek, black projector includes Edge Blending and 360-degree projection for a variety of installation applications. Its integration capabilities include 3G-SDI and HDBaseT™ connectivity, plus nine optional powered lenses (ships with ELPLM15 lens). Image Size: 60" - 500"
Dimensions: 23.1" x 8.3" x 19.4"